TNT has released another new promo, as well as the official key art poster, for the upcoming drama Good Behavior, filmed in Wilmington, North Carolina. Good Behavior will premiere on Tuesday, November 15 at 9pm on TNT. 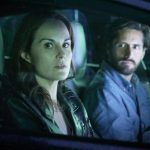 You can watch the newest promo, as well as the official trailer and previously released TV spots, for Good Behavior below, and then scroll down to view the new poster! ‘Good Behavior’ Premieres on TNT Tonight!